I almost forgot to include a post about the remaining part of Doi Phahompok National Park. You can read the first part here. The most popular part of Doi Phahompok National Park (Thai: อุทยานแห่งชาติดอยผ้าห่มปก) are Fang hot springs located nearby the town of the same name. The springs are very picturesque as they are located next to the mountains. On a large meadow there are randomly placed rocks of various sizes – all natural. The hot water comes to the surface and creates ponds of different shapes and sizes. The larger ones were adapted for egg boiling. We can buy a pack of eggs, submerge them in the hot water, wait for about 20 minutes and eggs are ready to eat. This way they will also contain minerals from hot springs and therefore they should be healthier. There are few large pools with hot water available for visitors (the water is not too hot so that entire families can enjoy) as well as private hot spring cabins with round shaped stoned bathtubs. The private cabin costed 50 baht per person (about 1 euro) per hour for min. 2 people (a single person could use a private cabin by paying for 2 people). The national park also contains some waterfalls. Unfortunately, most of them are localised in areas that are hard to reach (the roads are steep and unpaved). At the beginning I followed the way to one of the waterfalls recommended by a park ranger but eventually common sense took over and I turned back. I have only visited easily accessible Pong Nam Dam waterfall – maybe a small one, but not without its charm. Farms around Doi Phahompok National Park, Chiang Mai province, Thailand. Farmy w okolicy Parku Narodowego Doi Phahompok. Prowincja Chiang Mai, Tajlandia. The cool rocks near the entrance to Fang hot springs. Doi Phahompok National Park, Chiang Mai province, Thailand. Fajne skały blisko głównego wejścia do gorących źródeł Fang. Park Narodowy Doi Phahompok, prowincja Chiang Mai, Tajlandia. The cool landscape with natural rocks at Fang hot springs. Doi Phahompok National Park, Chiang Mai province, Thailand. Pejzaż z naturalnymi skałami przy gorących źródłach Fang. Park Narodowy Doi Phahompok, prowincja Chiang Mai, Tajlandia. The landscape with natural rocks and some handsome dude at Fang hot springs. Doi Phahompok National Park, Chiang Mai province, Thailand. Pejzaż z naturalnymi skałami i pewnym przystojnym gościem przy gorących źródłach Fang. Park Narodowy Doi Phahompok, prowincja Chiang Mai, Tajlandia. The hot water pond with natural rocks at Fang hot springs. Doi Phahompok National Park, Chiang Mai province, Thailand. Gorąca woda tworzy niewielkie sadzawki na powierzchni. Park Narodowy Doi Phahompok, prowincja Chiang Mai, Tajlandia. 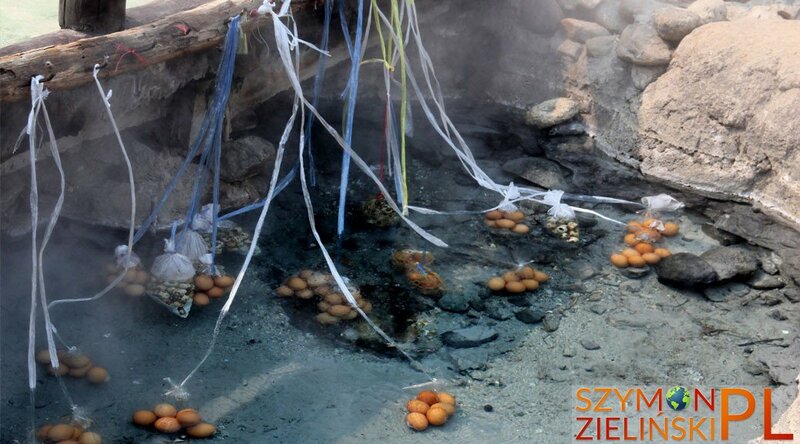 The hot water pond for boiling eggs. Doi Phahompok National Park, Chiang Mai province, Thailand. Sadzawka z gorącą wodą do gotowania jaj. Park Narodowy Doi Phahompok, prowincja Chiang Mai, Tajlandia. The hot spring (geyser). Doi Phahompok National Park, Chiang Mai province, Thailand. Gorące źródło (gejzer). Park Narodowy Doi Phahompok, prowincja Chiang Mai, Tajlandia. The hot spring (geyser) and awesome person in the foreground. Doi Phahompok National Park, Chiang Mai province, Thailand. Gorące źródło (gejzer) i świetny gość z przodu. Park Narodowy Doi Phahompok, prowincja Chiang Mai, Tajlandia. The pathway near private hot springs. Doi Phahompok National Park, Chiang Mai province, Thailand. Chodnik nieopodal prywatnych kabin z gorącą wodą. Park Narodowy Doi Phahompok, prowincja Chiang Mai, Tajlandia. Private hot springs. Doi Phahompok National Park, Chiang Mai province, Thailand. Prywatne kabiny z gorącą wodą. Park Narodowy Doi Phahompok, prowincja Chiang Mai, Tajlandia. Public hot spring pool. Doi Phahompok National Park, Chiang Mai province, Thailand. Publiczny basen z gorącą wodą. Park Narodowy Doi Phahompok, prowincja Chiang Mai, Tajlandia. Dirt road in Doi Phahompok National Park, Chiang Mai province, Thailand. Jedna z dróg w Parku Narodowym Doi Phahompok, prowincja Chiang Mai, Tajlandia. The road to Pong Nam Dam waterfall. Doi Phahompok National Park, Chiang Mai province, Thailand. Droga do wodospadu Pong Nam Dam. Park Narodowy Doi Phahompok, prowincja Chiang Mai, Tajlandia. Pong Nam Dam waterfall. Doi Phahompok National Park, Chiang Mai province, Thailand. Wodospad Pong Nam Dam. Park Narodowy Doi Phahompok, prowincja Chiang Mai, Tajlandia. Me and Pong Nam Dam waterfall. Doi Phahompok National Park, Chiang Mai province, Thailand. Ja i wodospad Pong Nam Dam. Park Narodowy Doi Phahompok, prowincja Chiang Mai, Tajlandia. Hilltribe person selling things. Doi Phahompok National Park, Chiang Mai province, Thailand. Sprzedawczyni z plemion górskich. Park Narodowy Doi Phahompok, prowincja Chiang Mai, Tajlandia.